Project obstacles and solutions: Magnetation, LLC is building a $350 million iron ore pellet plant outside of the small town of Reynolds, Indiana. The new plant is on the site of a failed ethanol plant along a rail line in rural northwest Indiana. When completed, the pellet plant will process 3 million tons of iron ore per year. The Reynolds location was selected due to the rail lines and available land. However, it is in a rather remote location. Any job of this magnitude needs building materials suppliers who can deliver on schedule. When a job site is miles away from other commercial centers, supply lines can be challenged. 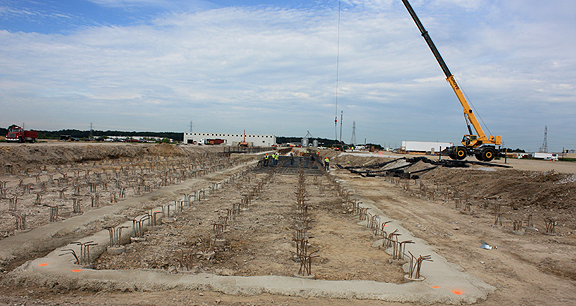 IMI recognized this and set up a portable concrete plant in nearby Monon, Indiana dedicated to the Magnetation projects. Concrete was also supplied by the central dispatch plant in Remington, Indiana when pours stretched beyond the capacity of the Monon portable mixer. Initially, IMI was to supply 70,000 yards of concrete for building foundations, floors and walls. However, as the construction process took shape, there was a need for bored auger cast piles, a process used for foundations in sandy soil. IMI was asked to supply 17,000 yards of auger cast grout for the 70 foot holes. This was placed as the auger was being pulled from the ground. IMI plant managers worked together with supply lines to make sure that raw materials were supplied to the portable plant. Trucks and drivers were reassigned as needed to meet the demands of this project. When finished, IMI will have supplied 100,000 yards of concrete and other perishable building materials to the Magnetation project.